Communities affected by large scale mining confronted Barrick Gold in Toronto, as gold markets went down. Over a hundred people braved the rain outside Barrick Gold’s annual general meeting to tell shareholders to divest from the gold mining giant. Protesters held a 14-foot effigy of founder and Chairman Peter Munk (85) with a Pinocchio nose and blood on his hands (Photo by Allan Lissner). The world’s leading gold producer operates mines and has exploration projects in nine countries: Argentina, Australia, Canada, Chile, Papua New Guinea, Pakistan, Peru, Tanzania and the United States. The company extracted 7,4 million ounces of gold last year, plus significant production of copper and silver. Barrick says they are dedicated to Responsible Mining but their name is repeatedly associated with corruption, abuse and environmental damage. Communities living around the gold mines often face depletion of water sources and the use of lethal force to deal with local protest. A carefully footnoted alternative annual report was delivered at the AGM by the campaign organization Protest Barrick. 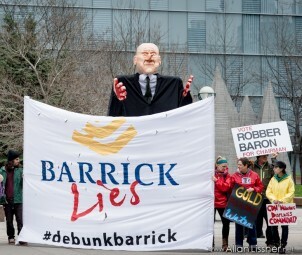 The report debunks Barrick’s Corporate Social Responsibility (CSR) programs and their socially responsible image, revealing “a pathological company that has ignored the warning signs of numerous conflicts across the globe”. For Sakura Sounders, editor of the report, “there is a growing disconnection between some of Barrick’s major human rights and environmental abuses and the reputation the company still maintains within select circles in Canada”. What seems to worry these people more, is the declining profit that the company makes. After twelve years of bullish gold markets in which the Canadian miner became the biggest gold player in the world, last week’s AGM took place after “the worst month in Barrick Gold Corp.’s modern history“. Last April, gold suffered the worst plunge since 1980 and gold future contracts lost almost 15% in two days. The company’s shares are down more than 50% in the past year going to its lowest levels since 1993. Barrick Gold is now worth $4.6-billion less than GoldCorp Inc., despite producing almost three times more gold. To make matters worse, Barrick is more indebted than any other gold miner (net debt is now US$12.5-billion, up from US$2.7-billion in 2010). The company seems to be going so bad that a group of institutional shareholders voted against executive-compensation proposals at the AGM, in a non-binding but symbolic protest to co-chairman John Thornton´s (the man viewed by many as Munk’s successor) proposed pay package of US$11 million. But a much bigger financial headache is situated somewhere in the Andes mountains. Probably the company’s biggest setbacks are in Pascua-Lama, the massive gold project located in the border of Chile and Argentina. Capital cost soared from an estimated US$3-billion in 2009 to US$8.5 billion today, making it the most expensive gold mine ever built. But even if Barrick could pull more money together and keep spending, just weeks ago a judicial court ordered the company to stop construction on the Chilean portion of the project. Later, an appeals court rejected Barrick subsidiary Minera Nevada’s plea to reverse the order. On the Argentina side, regulators also reacted against company plans. In July 2012, the Supreme Court ordered that the Glaciers Protection Law be applied to Barrick, despite their legal maneuvers to avoid it. After the debacle, Barrick sacked Guillermo Calo, president of South American operations, Robert Mayne Nicholls, general director for the region and Rodrigo Jimenez, regional vice president of corporate affairs. The Pierina gold mine is located in the Andean Cordillera in the Department of Ancash, Jangas district, in north-central Peru, at an altitude of 4100 m. On September 19, 2012, about a hundred protesters from the nearby Marinayoc Community gathered at the mine´s main gate to demand the provision of clean water, as the massive open pit and infrastructure built by the Toronto based company destroyed the mountain and its water sources. The police fired gas booms and, as they dispersed down the hill, attacked the protestors with shotguns. Nemesio Poma (55) was wounded and taken into the mine medical post were he later bled to death. Alejandro Rosales (45) was wounded in his back by bullet splinters; he was then taken to a clinic in Huaraz where, after three operations, the doctors managed to save his life. Marinayoc is a wonderful place that has provided for the needs of the Quechua indigenous people that have lived there for generations. Now the water cycle of which they depended on has been disrupted by the mine. Acknowledging this, Barrick offered to treat the water before it is released from the mine to the community. But as a mine official recognized “the community does not want to use water that comes from the mine, even though it’s treated and certified”. A truck provided by Barrick, as part of their CSR program, carries water every day from a secure source up to the community. But how long will this last? Another challenge for Barrick is that sustained growth in gold prices made governments demand a bigger share of the profits. In the Dominican Republic, the recently elected government is calling for changes in the contract governing Barrick’s newest operating mine, Pueblo Viejo (co-owned with GoldCorp) in the central province of Sánchez Ramírez. On April 13, hundreds of residents protested at the headquarters of Barrick’s subsidiary, Pueblo Viejo Dominicana Corporation, denouncing that the mine had hurt agriculture in the region. In Pakistan, local authorities in the province of Balochistan rejected the gold and copper Reko Diq project located at a remote site in the dry hills near the Afghan-Pakistan border. This year, the country’s top court declared invalid the lease held by Barrick and its Chilean partner, Antofagasta Minerals. Gold rallied from US$250 an ounce in 1999 to an all-time high of US$1921 an ounce in September 2011. For many investors and for the general public, the “golden decade” created the illusion that the metal would keep rising forever. Maybe it is just that, as one commentator suggested, “Things are looking up for the economy and, as a result, down for gold“. Over the past ten years, Barrick Gold´s human rights and environmental abuses had been masked by the constantly rising gold prices and the camouflage of CSR discourses. While the gold bonanza may be ending, as the glittering metal enters a stage of high volatility, the future of the communities living near Barrick operations seems more uncertain than ever.